If Hong Kong is a city of jade during the day, it becomes a luminous pearl with a sea of lights twinkling in the streets after dark. 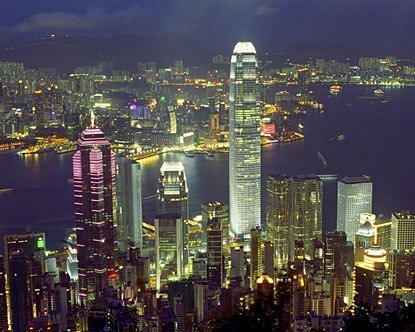 Where is the best place to enjoy the multi-colorful night scene that encompasses Hong Kong and Vitoria Harbor? Victoria Peak (太平山顶 tài píng shān dǐng) is a good location to view its night scene. Being 554 meters (about 1,817.6 feet) above sea level, Victoria Peak is the highest point within Hong Kong and occupies the western part of the island. How to reach Victoria Peak? Tourists can take the Peak Tram, a pleasant ride ascending the mountain. The tram has been in operation for over one hundred years, and to date, no accidents have ever occurred. Your journey aboard the tram will take eight minutes and upon reaching the summit you will see a seven storied building in the shape of a ship. This is the Peak Tower in which there are several attractions namely, Madame Tussauds Hong Kong, Ripley's Believe It or Not! Odditorium, and the Peak Explorer Motion Simulator. The Repulse Bay (浅水湾 qiǎn shuǐ wān) is the sandy beach of having the highest representative characteristics in Hong Kong by its long and broad beach, clean water, fresh sand, calm tide and gentle wave. 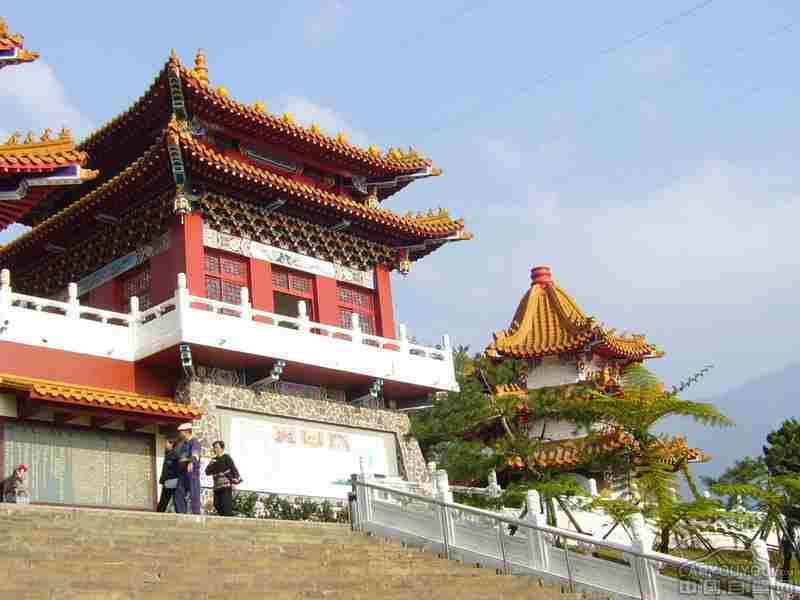 There constructed on the sandy beach a Sea View Tower of Chinese ancient colour, inside which there are images of Tin Hau (天后 tiān hòu)(the Queen of Heaven and Protectress of Seafarers) and Goddess of Mercy (观音 guān yīn), Avalokitesvara (千手观音 qiān shǒu guān yīn) more than ten meters high. Beside it, there is a Bridge of Longevity (长寿桥 cháng shòu qiáo) across which the image of Yuexia Laoren (the god of matchmaker) is there with a conjugal felicity stone beside him. It is said that after worshipping the god of matchmaker and striking the conjugal felicity stone, the conjugal felicity surely emerges. This is the place marriage seekers must come. At the back part of the beach, there is a building of colonial colour---Repulse Bay, whose predecessor was the Repulse Bay Hotel and now the catering and recreation center.Repulse Bay, located in the southern part of Hong Kong Island, is the most spectacular bay in the region. Its name comes from a 19th century battle in which the British army repulsed attacking pirates. Today, Repulse Bay is a luxurious residential area for dining, relaxation, and aquatic activities. Ocean Park (海洋公园 hǎi yáng gōng yuán) is a major attraction in HongKong, the luminous pearl of the Orient and world financial center in southeast China. Hong Kong's mild climate and coastal scenery, attracts throngs of visitors annually from all over world. Any visit to Hong Kong should include the world famous Ocean Park. Hong Kong Ocean Park is located on the south end of Hong Kong Island. The larger of two sections is on the headlands of Mount Nanlang. With an area of 170 miles, it's one of the largest ocean parks in the world. The two entrances to Ocean Park (Tai Shue Wan Entrance and Main Entrance) are connected by cable-car. One of the oldest and most famous and beautiful temples in Hong Kong is Man Mo Temple (文武庙 wén wǔ miào). It is located at the intersection of Hollywood Road and Ladder Street. The temple was built in the 1800s, at the beginning of the British colonial rule. A copper bell in the temple, made during the reign of Emperor Daoguang (1820-1850), proudly proclaims the temple's long history. Although it has been remodeled several times, the temple still maintains its original appearance. Inside the temple are delicate wooden bases used for transporting deities during parades and festivals and incense burners made of copper and other metals. Huge tower-shaped incense coils are always hanging from the ceiling of the hall and over the courtyard. And the smoke of the burning incense, together with the sunbeams, adds an element of mystery to the temple and indicates happiness, health and fortune. 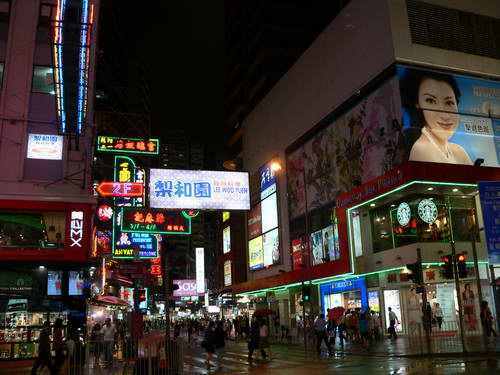 If you shop and entertain in Hong Kong, do not miss Causeway Bay (铜锣湾 tóng luó wān ) . Causeway Bay was a shoal more than a hundred years ago. After reclamation it was earth-based and gradually became a commercial area with an interconnecting road system. Now, it serves as a very popular center for shopping, dining and nightlife in Hong Kong. If you are interested in shopping, the ultra-modernTimes Square (时代广场 shí dài guǎng chǎng ), the Japanese department stores and the fashion boutiques should not be missed. Times Square, a symbol of Causeway Bay, is the biggest emporium in this area and one of the top ten scenic sites in Hong Kong. Many well-known brands of clothing can be found here.